"When was the last time you remember doing something during the day?" The only something I remember doing during the day for the past week and a half is listening to Dark City commentaries while I work from home, and I think I might slowly be turning into Wolenski. The chase music has been haunting me day and night. Were large portions of this soundtrack reused for The Matrix? It seems like they might have been released too close together, but I swear the musical motif at 2:26-2:39 and the sound effect at 3:33 in "Into the City" (and elsewhere) are lifted wholesale by the Wachowskis (or whoever did their sound design). Maybe I'm just being paranoid? You see, I picked up the Dark City blu-ray because I found it for $3.99, not knowing that it came with six distinct commentary tracks. Most interestingly there's commentary from Renowned Film Critic and General Movie Legend Roger Ebert (one of the few critics to stand up for the film on its troubled initial release, helping to hold it back from obscurity), but there are also tracks for Alex Proyas (director & co-writer), Lem Dobbs and David S. Goyer (co-writers), Dariusz Wolski (cinematographer), and others. 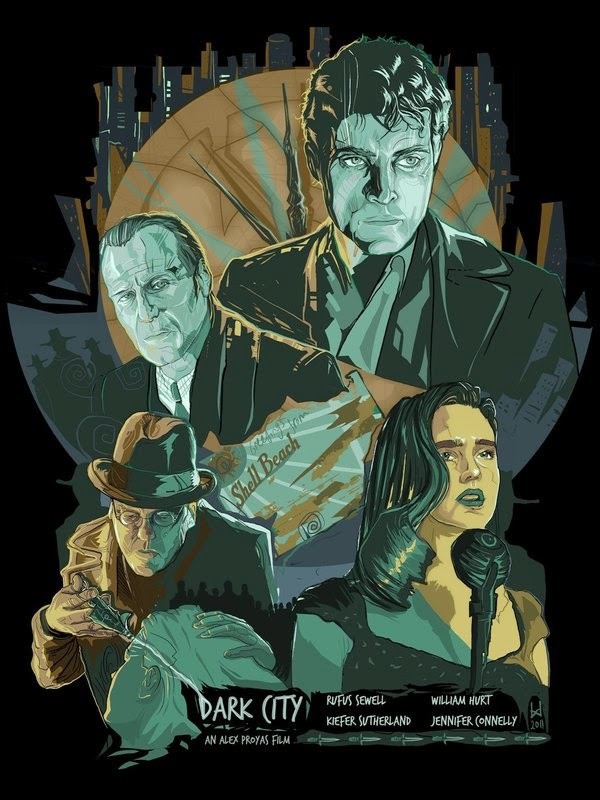 To be totally honest, I'm so full of Dark City trivia at the moment that there's no way I can realistically sort through all of it, but I'll try to pull out the best of the best and put my own spin on it along the way. "So Husselbeck, what kind of killer do you think stops to save a dying fish?" 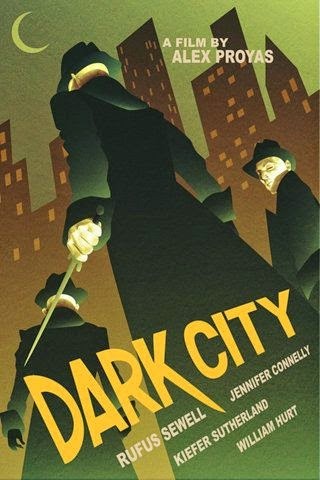 The fundamental struggle with Dark City was one suffered by many strange science fiction movies: getting it to the right audience. The studio didn't understand the film and test audiences didn't understand the film, so Proyas was forced to put an expository voiceover narration at the beginning of it. According to the commentaries (mostly Proyas) there were a lot of other minor cuts (mostly cutting down character scenes and "unnecessary" dialog), but the biggest change was the voiceover, which (as it always does) killed a lot of the story's mystery. Honestly, after watching both versions multiple times I think the theatrical cut does work, although not quite as well. Fortunately home video releases now have a director's cut with the missing content and without the voiceover, but while I can understand the studio's hesitation (Proyas didn't exactly give them what they paid for), these cases of studio intervention are always regrettable. Proyas, Dobbs, and Goyer all have fascinating things to say about what they think the movie means, but almost everything they have to say only covers the surface of the text. Dark City is very much a movie where the themes play across the top of the film, and this is most of what the writers talk about. What constitutes our identity in a world where aliens can control our memories and fingerprints? Neither they nor the film really has an answer for this—I love the film, but its final act where everything basically devolves into a boss battle and a woman-as-reward finale is by far its weakest element—but to be fair, it is essentially an unanswerable question, and great films don't necessarily have to answer big questions as long as they pose them in an interesting way. The cinematographer (Wolski) and production designer both had interesting things to say about the style of the film. At one point, Proyas mentions that he wanted to make the above-ground (non-Stranger) scenes appear as "documentary realism", which is funny because they turned out so obviously stylized that I can't imagine going in with that intention. I love the way these scenes look, but I wouldn't say they look realistic in the slightest (whatever that would mean for a world that is essentially an alien spaceship). Wolski says at one point that all the lighting for these scenes was done with practical lights, which is part of what gives it its neo-noir aesthetic (noirs were also lit as starkly as possible), but whether the style is overpowered by the purposeful mixing of period set dressing or the Blade Runner-inspired shots of the city, this doesn't succeed in making them look realistic. They also mention that one of their big inspirations for the appearance of the film was German Expressionism and in particular Fritz Lang's films M and Metropolis (an influence Ebert goes into at some length). And the analogy works, although the jagged lines and imposing architecture doesn't serve as refined a purpose as in Lang's masterpieces. The city towers over the characters that inhabit it, and although the saying has become a cliche there is perhaps no movie that embodies it more precisely than here: the city is a character in the story. It changes as the narrative progresses and is altered forever by the conclusion. 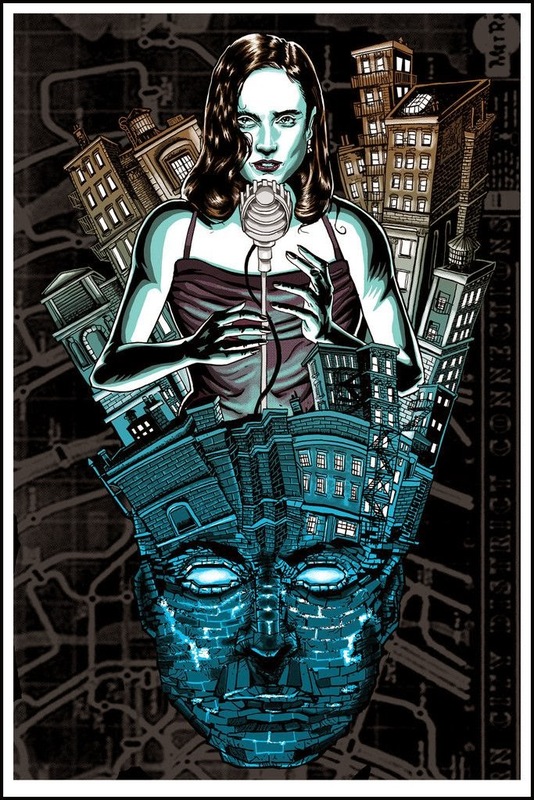 Overall Dark City is a movie that I love in spite of the problems I see in its storytelling. The boss battle in the finale is disappointing after the intelligent setup that brought us there, and the way the ending embraces the fantasy which the rest of the film sought to critique or at least critically examine seems naive (although I do like that Murdoch doesn't simply give himself the girl in the world he creates, seeming to understand that we enjoy the journey more than the destination). But these are problems I can put up with when the majority of the film is so rich in both thematic texture and stunning visual design. Although it takes inspiration from other sources (was Blade Runner not the original "dark city"? ), it combines them in new and exciting ways that would inspire the filmmakers that followed it (how much of it can we see in The Matrix?). It is unique, intriguing, and beautiful, and deserves a place in our canon of science fiction cult classics. - There is a recurring motif of deep, narrow spaces above ground with Murdoch and wide, open spaces below with Dr. Schreber & the Strangers. - Murdoch has to learn love from someone whose love is fabricated (Emma isn't so much in love with John as she simply remembers being in love with him, although that love is real enough to her). - In an interesting role reversal, the rulers of the city are also the ones working underneath it (the opposite of Metropolis, for instance). - Dark City as metaphor for moviemaking or storytelling: the genre conventions aren't what's important. The scene is set as a generic murder mystery, but what ends up taking center stage even in the plot itself is the thematic and emotional concerns about what makes us human. It is an investigation which expands to include the parameters of its own existence. This is a problematic reading of the film for me (and for Ebert) because it takes the way the film makes its subtext into actual text as a purposeful, beneficial maneuver (which I don't think it is), but it certainly is interesting to think about.